Which is Better: HTC U11 or Samsung Galaxy S8? Samsung and HTC brands need no special introduction to most Android phone users since both of these brands have been at the forefront of the Smartphone industry for a very long time. The Samsung's iconic Galaxy series has been enriched with yet another addition on April 21, 2017, and the Galaxy S8 model seems to be a worthy successor to the much praised Galaxy S7. Just a couple of weeks later HTC U11 model, that many are calling an attempt to challenge seemingly unchallengeable Samsung Galaxy S8, was presented to the world. We made an attempt to compare these two Android Smartphone powerhouses and come up with a verdict which one is better. Let's have a look at what these two remarkable Smartphones have to offer. Despite numerous differences, Samsung Galaxy S8 and HTC U11 are fairly similar in size and weight. With dimensions of 148.9 X 68.1 X 8 mm Galaxy S8 is slightly smaller than the U11 that has the following dimensions 153.90 x 75.90 x 7.90. The difference in weight between the models is around 14 grams since the slightly heavier HTC U11 weighs 169g while Galaxy S8 has approximately 155g. Both models are elegantly designed, but without a screen protector, both Smartphones are relatively difficult to keep clean from fingerprints. The HTC U11 utilizes the liquid surface design which mostly uses glass and makes the U11 quite attractive even to the most vicious critics. The Galaxy S8 is, perhaps designed more conventionally, with the use of materials like glass and metal, but that doesn't make it any less elegant. Possibly the biggest annoyance with Galaxy S8 is that the manufacturer opted to position the fingerprint scanner in the rear next to the camera, unlike the U11 that has the fingerprint scanner embedded in the home button. The HTC U11 and Samsung Galaxy S8 are both designed to perfectly fit the user's hand and the attractiveness of their design is best decided by the user's taste. With the diagonal of 14.7 cm and the screen resolution of 2960 X 1440 pixels, the Samsung Galaxy S8 is equipped with one of the best Smartphone displays currently available on the market. The display has a pixel density of 570 ppi and it is empowered with Quad HD and Super AMOLED technologies and it also features a High Dynamic Range that offers better brightness and contrast in apps that the phone supports. Unlike the Samsung Galaxy S8, the HTC U11 isn't HDR-enabled because the manufacturers opted to use the LCD panel that has a resolution of 2560 X 1440 pixels. With 13.9 cm Quad HD LCD display and a slightly lower pixel density than the Galaxy S8 at 534 ppi, the HTC U11 is clearly no match to Samsung's latest Galaxy series model. Despite crisp images and vibrant colors U11's screen provides, its front side appears to be bulkier than on most of the Smartphone models of its class. One brief look at Samsung Galaxy S8 and HTC U11 makes it obvious that performance isn't an issue for both of these Smartphones. Galaxy S8 features octa-core Exynos processor on the models made for markets outside of the USA and China and Qualcomm Snapdragon 835 processor on models for the US and Chinese markets. Galaxy S8 is equipped with Mali-G71 or Adreno 540 GPU, depending on the market for which the phone was produced. 4GB of RAM memory on top of that guarantees that Galaxy S8 can smoothly perform even the most demanding operations. Its internal 64GB memory can be extended up to 256 GB, which leaves plenty of room for data storage. The HTC U11 has the same processor as the one in the Galaxy S8 models designed for markets outside of the US. A Qualcomm Snapdragon 835 processor is empowered by Adreno 540 GPU and the users can choose between models with 4 or 6 GB of RAM memory. The U11 has 128 GB of internal storage space that can be expanded up to 256 GB with Micro SD cards. The differences between these two flagship Smartphones are minor when it comes to hardware, which makes it difficult to say which one is better. The HTC U11 has a superb rear camera that is capable of high-end performance in low-light conditions. The rear camera uses a 12MP sensor, f/1.7 lens, optical image stabilization and dual-pixel Autofocus to ensure a great all-around performance, but the U11's front camera has even more to offer. With 16MP sensor and aperture f/2.0, HTC U11's front camera can record 4K videos at 30fps or Full HD videos. Unlike the mighty front camera, HTC U11 is equipped with, Samsung Galaxy S8 has an 8MP front camera sensor with a f/1.7 aperture capable of recording 2K videos. The rear camera is, however, an entirely different matter, because its 12MP f/1.7 sensor is capable of producing stunningly sharp and detailed images in good light conditions. The Galaxy S8's rear camera is a remarkable performer even in the most difficult light conditions due to optical image stabilization. For those users who like to make videos with their Smartphones, Galaxy S8 has a lot to offer because it can capture 4K videos at 30fps, 1080p at 30 or 60fps and 720p at stunningly fast 240fps that is perfect for creating slow-motion videos. Even though HTC U11 has better sensors with more megapixels, Samsung Galaxy S8 offers more options to its users. The HTC U11 and Samsung Galaxy S8 both feature non-removable Li-Ion battery with the capacity of 3000 mAh. The battery on Galaxy S8 can support up to 1200 minutes of talk time and up to 16 hours of video playback time, and with normal use, you'll have around 30% of battery at the end of the day. The USB-C charging port enables you to fully charge the Smartphone's battery in just a couple of hours. With battery life expectancy of approximately 24 hours, the HTC U11 has a battery performance that can be described as average at best. It features a Qualcomm QuickCharge 3.0 technology that speeds up the battery charging time. Despite these battery features worthy of the best Android Smartphones on the market the HTC U11's battery performance falls short of Galaxy S8's because of the low-power, always-on screen technology that allows Galaxy S8's battery to last well over 24 hours. Only a few years ago, water resistant Smartphones were a thing of the future. Today, a growing number of Android models are made to be dust-proof and waterproof. Both Samsung Galaxy S8 and HTC U11 have dust and water resistant bodies that can be submerged in water without any ill effects. The Samsung Galaxy S8 has an IP-68 rating, which means that it can withstand submersion in fresh water for 30 minutes at a depth of 1.5 meters. On the other hand, HTC U11 has an IP-67 rating, which means that it can be sunk into the water deep between 15cm and 1m for around 30 minutes. However, both of these Smartphones are not fluid resistant and the users should pay close attention to what kind of fluid they want to put their Smartphone in. The operating system on the HTC U11 is the Android 7.1.1 Nougat with HTC Sense 8.0 overlay. The U11 also features an HTC Sense companion that can make personalized suggestions based on the user's daily routines as well as suggestions based on the user's location. The Samsung Galaxy S8 has the identical Android 7.1.1 Nougat operating system, but with a Samsung Experience 8.1 overlay that was first introduced with Galaxy S7. Even though both of these Smartphones have a user-friendly interface equipped with the latest apps and WiFi connectivity options, they both leave room for improvement on next models. The HTC U11 has been available for purchase for little over a month and in such a short time it has attracted a lot of attention. With the starting price at $649, it is practically a steal for a Smartphone that is equipped with the cutting-edge technology that puts the U11 model at the very top of its class. The Samsung Galaxy S8 has been praised as the best Android phone of its generation that can be compared with the latest iPhone 7 models. The Galaxy S8 was available internationally at the starting price of $889 when it was first released, but just a few months after its initial release the Smartphone's price has been slashed to $665. The international models feature a different processor than the one used for the US and China markets. Comparing HTC U11 and Samsung Galaxy S8 is like comparing Kevin Durant and LeBron James. Like Durant and James, these are the leading players on the Android market today, and it is rather hard to say that one is better than the other. However, the level of innovation introduced with Galaxy S8 has completely revolutionized Android Smartphones and even made them comparable to iPhones. 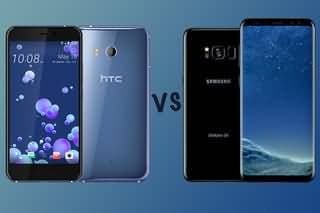 For that reason, our opinion is that Samsung Galaxy S8 is a Smartphone that has more to offer to its users, but HTC U11 is still an elite Android phone that can be relied upon.